The Gila Cliff Dwellings are located in the Gila Cliff Dwellings National Monument north of Silver City, New Mexico. The cliff dwellings were built by the Mogollon (mah-gee-ahn) Culture in the late 1200's. The monument was established by President Theodore Roosevelt in 1907 and lies next to the Gila Wilderness Area which was designated in 1924 and became the first wilderness area to be created in the world. 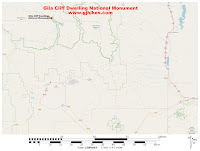 Gila Cliff Dwellings National Monument is 45 miles north of Silver City on New Mexico Highway 15. The road has a lot of winding curves and can take several hours to travel so be sure to give yourself enough extra time. The scenery is great though so it turns out to be a nice drive. After reaching the Visitor Center it is a short drive to the Gila Cliff Dwellings trailhead where there is a small museum. Behind the building they have several kennels where you can leave you pets if need be. This is also where you can pay the required fee or show your parks pass. The trail is open daily 9am-5pm with the last visitors allowed in at 4:30. Everyone must be off the trail and out of the Monument by 5pm when the gates are locked until the next day. The trail begins by crossing a foot bridge that takes it over the West Fork of the Gila River where on the opposite side the trail splits and begins its 1 mile loop. Hiking up the canyon is a delight all by itself. Multiple times the trail crosses from one side of the canyon to the other making use of newly reconstructed bridges. Near the head of the canyon the trail crosses the stream for the last time and begins climbing up to the level of the cliff dwellings which are already coming into view. There are several spots as the trail climbs up to the ruins where you can stop and rest and take a few pictures. As the trail levels off there is a meet up spot where the daily 1pm guided tour begins. If you miss out on the guided tour don't fret as there is always a ranger at the ruins to ask any questions. From the meet up spot the trail travels along the bench passing a minor ruin before coming to the main dwellings. To get up into the ruin via the main route requires climbing a short set of wooden stairs. The stairs have a handrail on one side that makes it a little easier. The ruins are tucked away inside an alcove that is behind 3 large openings in the cliff. The alcove is filled with adjoining rooms from one end to the other. It is interesting that after putting so much effort into the cliff dwellings construction that they only occupied it for a mere 20 years. Some of the architecture resembles that found in other places like Chaco Canyon and Mesa Verde. Besides just walls to look at there are the faint remains of a murro, some pictographs and items like these baskets that are filled with corncobs. At the exit point of the ruins there is a tall ladder to descend. They probably wouldn't object to someone going back to the first entrance and taking the stairs. After leaving the ruins the trail continues around the mountain along the bench where several long switchbacks take it back down to where the loop began. Visitors will want to take a few minutes to tour the museum at the trailhead. If you saw any plants or animals that you couldn't identify the rangers at the trailhead can help you out with that. 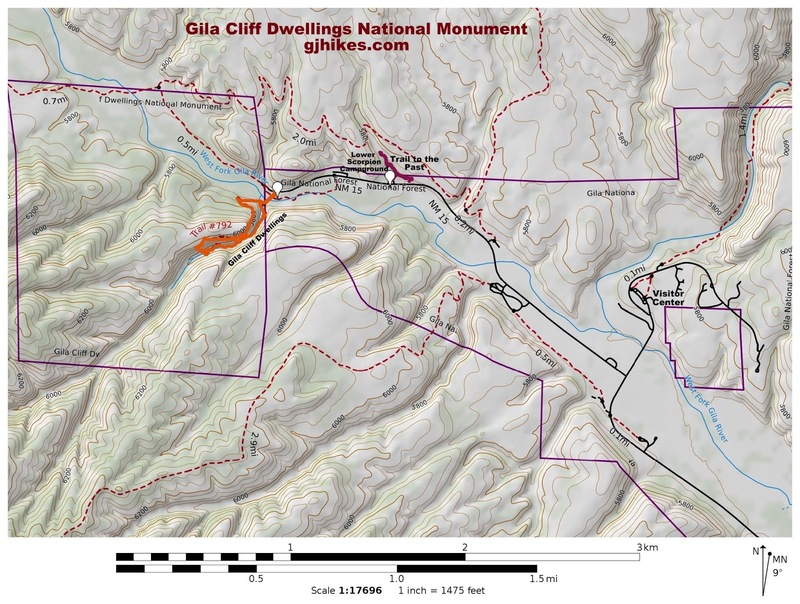 Gila Cliff Dwellings National Monument has 2 campgrounds to accommodate overnight visitors. When we were taking the pictures for this post we stayed the night in Silver City. 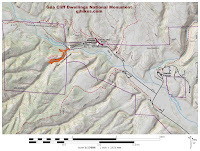 There are also a few places to camp in the Gila National Forest along Highway 15. 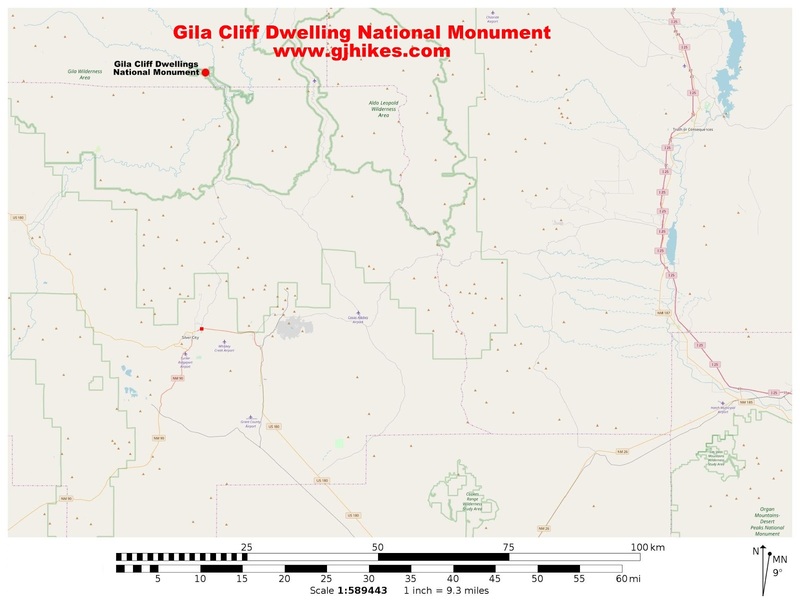 For those that like exploring ancient sites we have no trouble at all recommending the Gila Cliff Dwellings. If you would like to see it for yourself then all you have to do is 'Take a hike'.